We are often asked by beach lovers on our preference amongst Seychelles, Maldives and Mauritius. We have been to the Maldivian islands twice and to Seychelles once. Sadly, Mauritius hasn’t been ticked off our travel bucketlist as yet and our comparison is between Maldives and Seychelles. While I vote for Seychelles, Ankur votes for Maldives! The Seychelles are granite island, dotting the Indian Ocean. Huge granite boulders adorn beaches and have been sheltering marine life since time immemorial. The Maldives, are coral islands… rings of sandy, living, breathing coral. At times, imagining the weight of an entire holiday resort on nothing but coral does scare me, but all seems well so far! The bigger islands in Seychelles (Mahe and Praslin) are large enough to be explored by renting a car. Beach hopping is ideally done by packing a picnic basket and hopping from one beach to the other in your car or local bus. Smaller islands like La Digue can be explored on foot or on a bicycle. 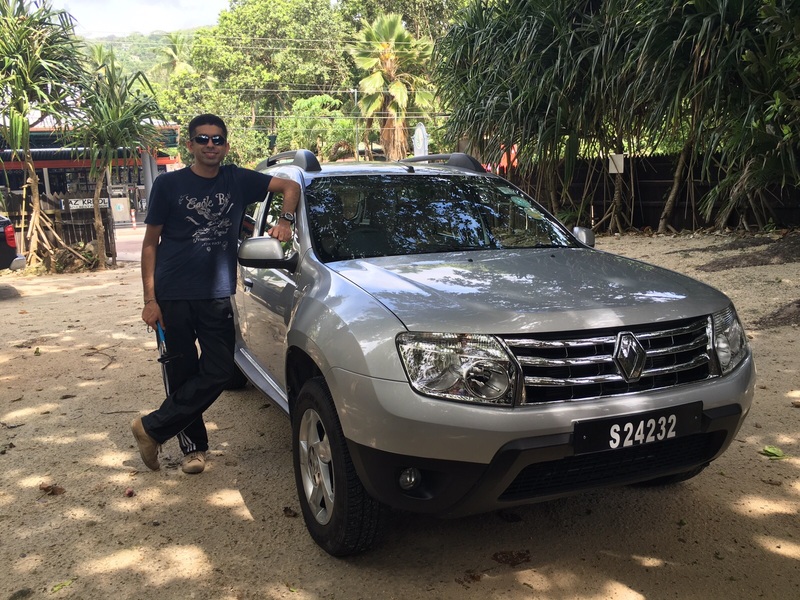 Most islands in Maldives are not big enough to explore by car. You can simply walk around and explore a major portion of the island. The larger Maldivian islands like Gan have local villages with a few resorts by the beach and do have roads on the island. However, most islands are resort islands i.e the resort covers the entire island (which can be explored on foot/cycle/golf carts). Seychelles was a French colony. The local culture reflects a mix of French, African and native Seychellois culture. Majority of the population is Christian, with a small percentage of Hindus and Muslims. You are free to wear anything and everything on the island and on the beaches. Maldives is a Muslim nation and you need to dress conservatively in line local customs. Swimwear is not allowed on the beaches around the local villages. However, you are free to wear swimwear/bikinis at the resort island or on private beaches. 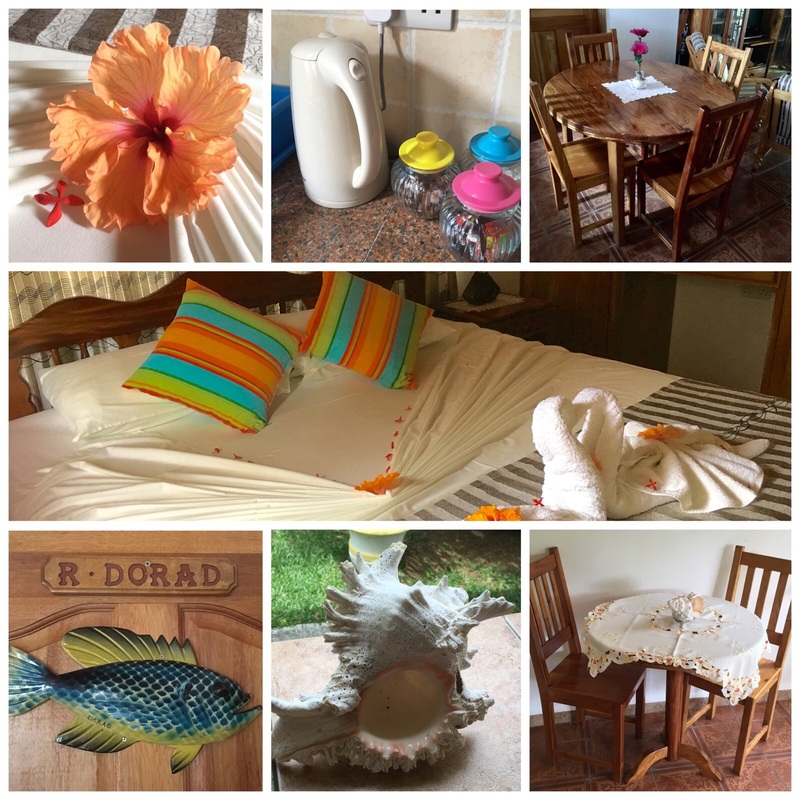 Seychelles can be done on a budget… not a shoestring budget… but definitely on a budget. There are guest houses to choose from that can let you stay for as low as USD 75 per night for a room. If you are looking for luxury, you can rent a a room in a villa that is next to one owned by David Beckham, which sure comes at a price. Sea side luxury resorts, little chalets on a palm fringed hillock, a cosy room a sleepy sea side town or an island to yourself – Seychelles has it all. We spent two nights at the Kempinski in Mahe and four nights at B&Bs in different islands, each being a different experience. If staying over turquoise blue waters in a stilted water bungalow has been on your bucketlist, Maldives is the destination for you. Almost all island resorts have water bungalows to let you live your dream. If you are looking for a budget getaway, cheer up. 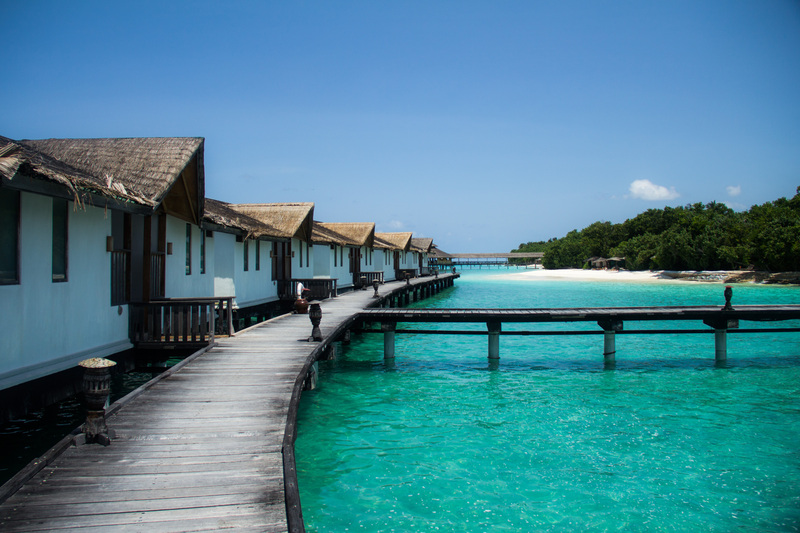 The Maldivian authorities have allowed locals to run bed and breakfast services very recently. However, these B&Bs are in the local villages and you will have restrictions on what you wears. The best would be to ask the B&B to get you a day pass to one of the resorts, which typically include use of the pool, beach facilities and buffet lunch. 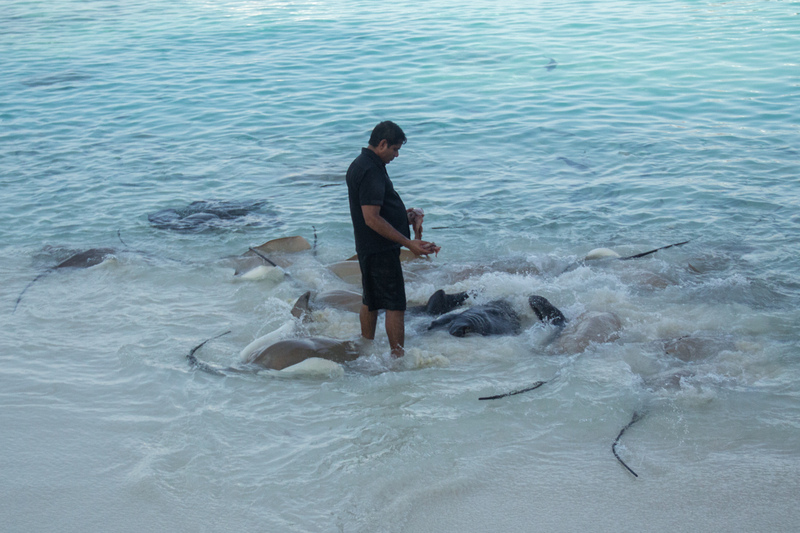 Local cuisines of both islands are dominated by sea food, obviously! However, finding good vegetarian food in the both island nations is a challenge, unless you eat at the restaurant of a five star hotel. 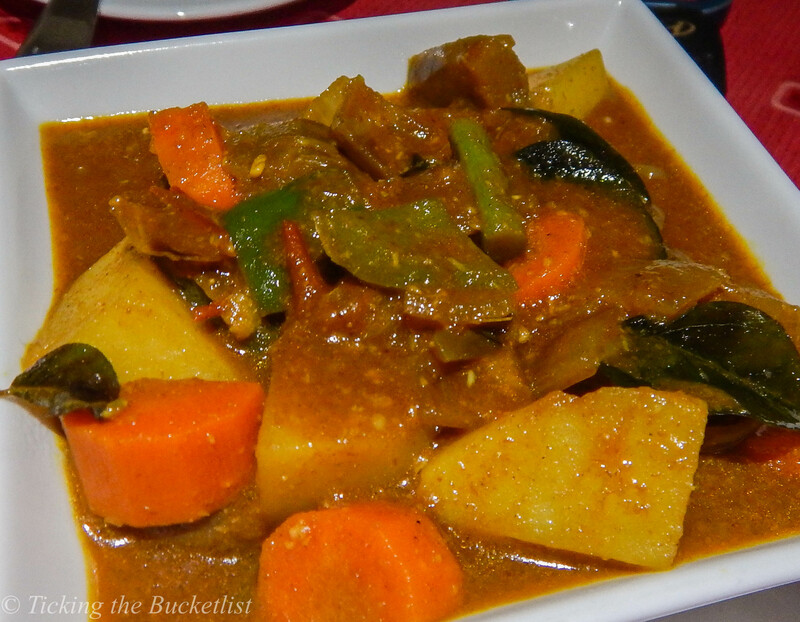 The Creole cuisine is unique, with spices and lots of coconut. Its an interesting mix of Indian and African cuisines. The Maldivan cuisine, on the other hand, clearly reflects an influence of South Indian cuisine. 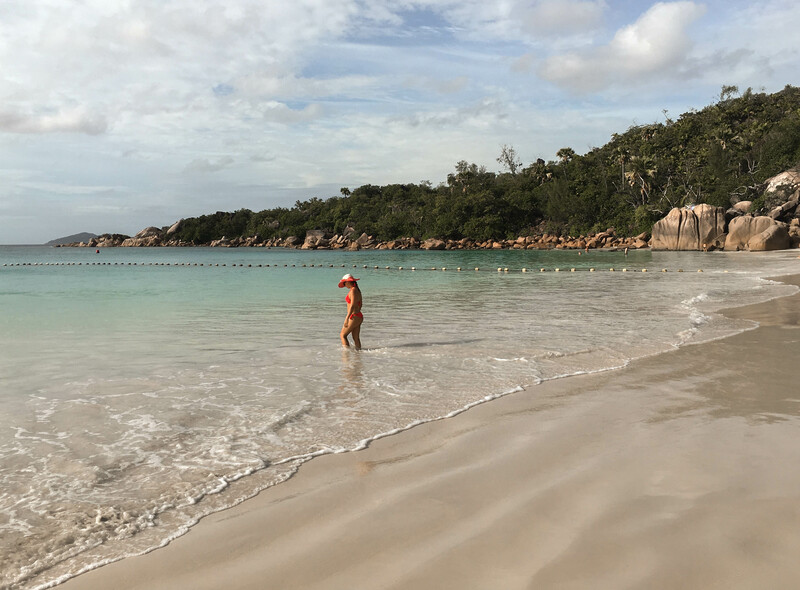 Seychelles offers a plethora of activities… island hopping, beach hopping, road tripping, hiking and off course, bird watching, SCUBA diving and snorkelling. Praslin is the only place in the world where the black parrot can be sighted in its natural habitat. Oh… I missed mentioning tortoise feeding! We did a hike in Vallee De Mai on Praslin and it was a day well spent under shaded palms. We spotted a pair of black parrots and some really interesting geckos. We did a snorkelling trip to Felicite Island and the marine life was as good as we have ever seen (including the Maldives and the Red Sea). However, snorkelling off the coast was just very average, except in La Digue. Its is imperative to take a snorkelling trip to see the healthy corals. SCUBA was great! We spotted sharks, rays, eels, lion fish, turtles and a host of other colourful beings. 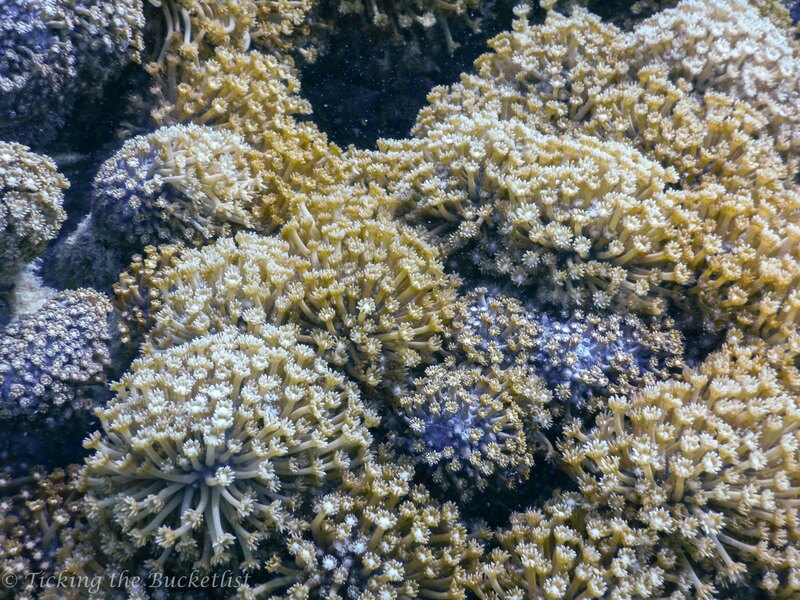 The granite boulders under the sea added such a dramatic feel to the underwater world. Maldives lets you enjoy all that the ocean can offer… swimming, snorkelling, SCUBA diving and water sports. There really isn’t much that you can do on land, except for the activities offered by your resort. Snorkelling and SCUBA diving in Maldives, is beyond doubt, excellent. We have sighted whale sharks, manta rays, spotted rays, sea turtles and off course, Nemo in the Indian Ocean while were in Maldives. 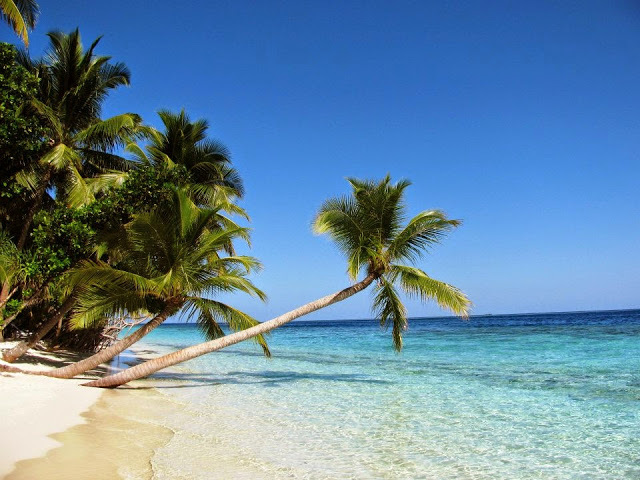 Snorkelling from off the coast is excellent and most resorts have a living house reef, making the activity more comfortable for those who aren’t too comfortable snorkelling in the open sea. We have been to Maldives twice and to Seychelles only once. Given a chance, we would be delighted to repeat any of the destinations! Both are picture perfect tropical destinations… warm and sunny, with powdery sand and blue waters. Its time to pack up your swimwear, sunhat and sunscreen… Paradise calling! Hmmm upon reading the comparisons I can honestly say I wouldn’t know how to pick between the two! I think both places have their positives. 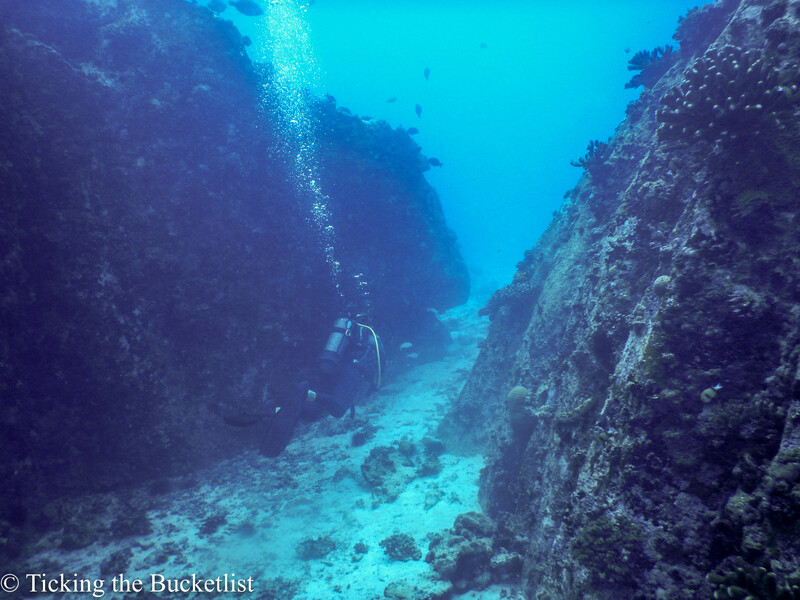 I would jump at any chance to go to either- they look so luxurious and I would love to scuba and snorkel in both places! Thanks for the great information! So both these places are on my bucket list anyway but thank you for comparing! It is great to hear Seychelles can be done on a budget! I have wanted to visit for so long! Such an amazing post indeed.So glad to read that BnB’s have also started in Maldives but would definitely love to stay in a beach cottage some day.Seychelles look so good and untouched.Would definitely add these destinations to my Scuba Destinations. What a choice to have to make! I’ve been to Mauritius and just from your descriptions of the Maldives and Seychelles, I would easily pick one of those two if I had to! The Seychelles would probably win at the moment though, just because you can do it on a budget and I’m still paying off our Africa adventure! Although I want to visit both these places, the actual debate in my mind is which first. You have very nicely compared the two . torquoise blue water is really my first choice. So, guess I have made up my mind. I have been to the Maldives and was very underwhelmed. I felt the beaches didn’t wow me the way I hoped and the food was average. That being said, I did love the atolls and snorkeling. I do want to go to the Seychelles though! My parents have been to Maldives and I’ve been to Mauritius and I’ve just come to the conclusion that no matter where in the world island life is the best and comes with its own uniqueness. Maritius has a lot more options but I known from people that Maldives and even Seychelles is laid back and more relaxed. Love those pictures, especially the marine ones. I haven’t been to either the Maldives or the Seychelles but your pics remind me of snorkeling in Koh Phi Phi in Thailand. I’m now a big fan of snorkeling and have stuck the Maldives and the Seychelles on my bucket list. Nice post. Thanks for sharing. All the best and good luck with everything! My dad’s favourite place on earth is Seychelles (he’s got some great stories from the place). I can definitely see the appeal! I’ve always wanted to visit both. I’m a scuba diver so I think I’d be spoilt for choices either countries I go to. But it’s interesting to see a comparison of the two. Thanks for sharing! I often to see the photo of resort with clear water in Maldives, indeed Maldives is stunning and alluring! Seychelles looks good, too. But may be if I were to choose either one to go, I will choose Seychelles for its various activities that could be done.